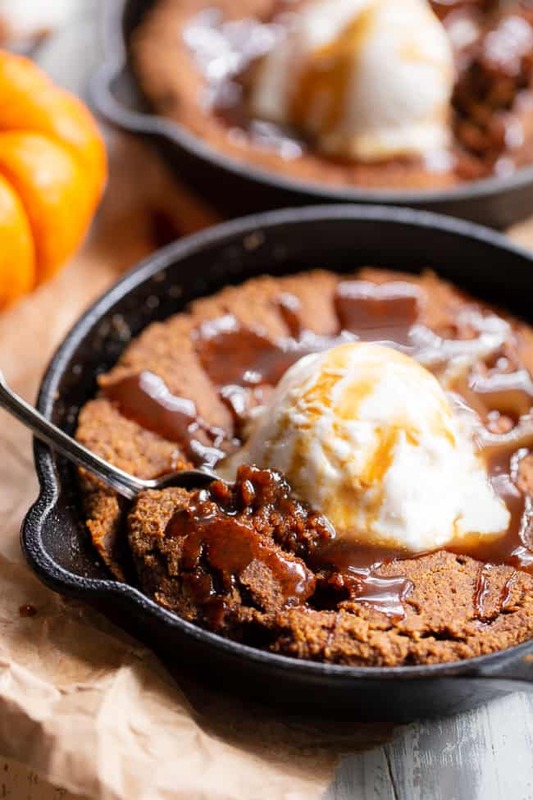 This fudgy pumpkin snickerdoodle skillet cookie is loaded with pumpkin spice and cinnamon, drizzled with dairy-free salted caramel sauce and topped with coconut vanilla ice cream. 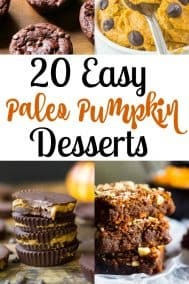 This rich paleo dessert is perfect for fall and the holiday season! Kid approved, paleo, dairy-free, grain-free. I hope you’re ready, because we’re getting into ALL OUT dessert mode right here, right now. I guess I just didn’t want to/couldn’t hold anything back at all with this one, and we’re basically having all our fall/holiday dessert dreams come true. 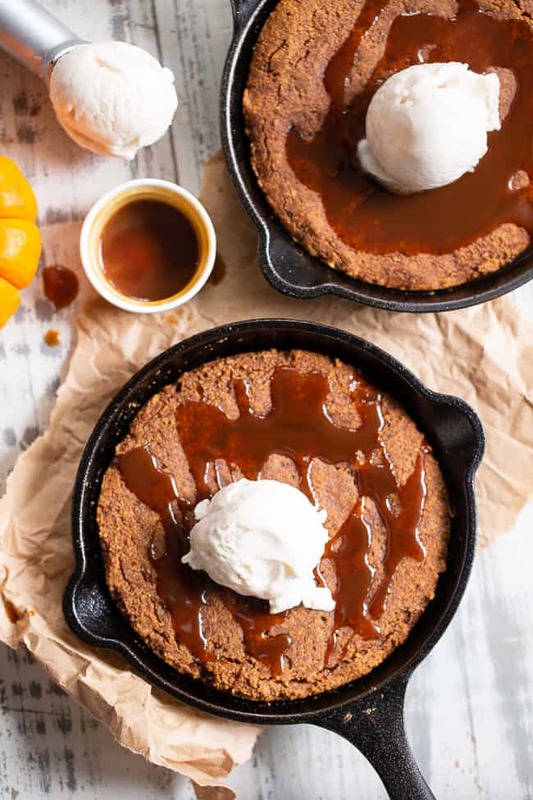 A rich, fudgy, gooey pumpkin snickerdoodle skillet cookie with warm spices, topped with salted caramel sauce and then ice cream, if you dare. And you WILL dare, because 1.) you can’t lose and 2.) 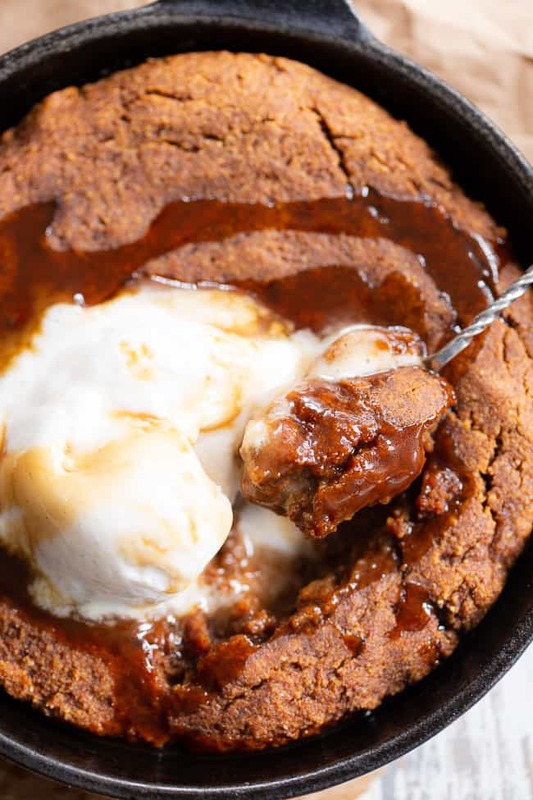 skillet cookies and ice cream are meant for each other. 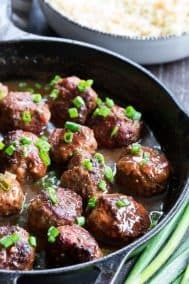 Even though the title and description seem sort of, long/complex/like a lot of work – do not despair, and do not doubt for even a second that this recipe is actually super simple to make! The cookie dough/batter comes together all in one bowl without any equipment needed (other than a whisk) and if you can believe it, the salted caramel is even easier than that! 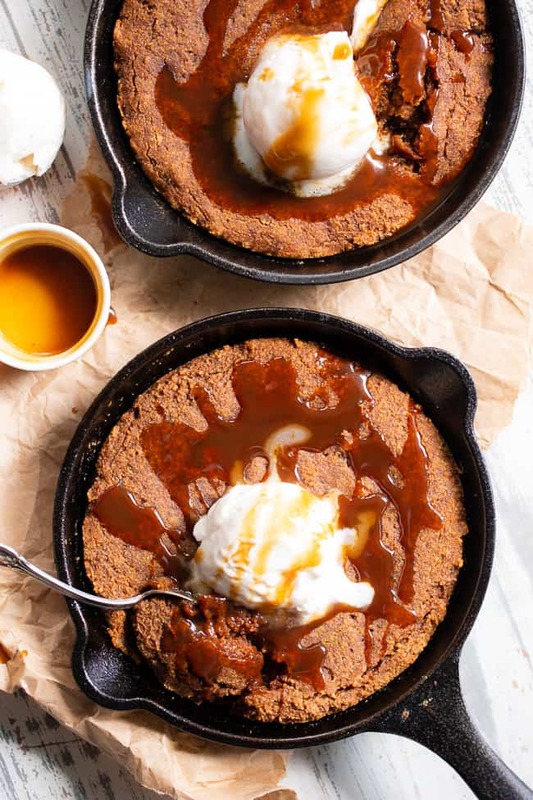 Plus, baking in a skillet (or 2 skillets) means you don’t need to spend extra time chilling dough and dropping cookies on sheets or cooling them. 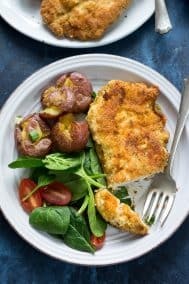 You simply put in the batter in the skillet, bake, and dig in! 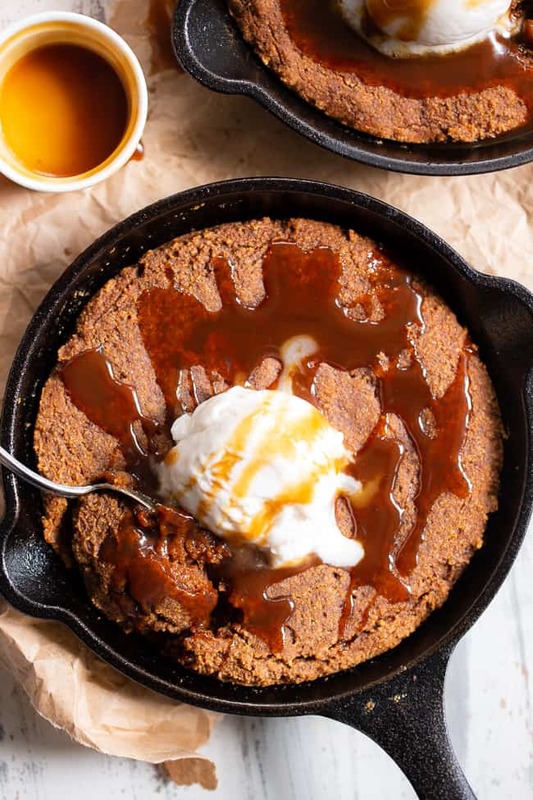 Although this is the perfect dessert to bake and eat right away, you can also make the skillet cookie part ahead of time if you want. Then, you simply reheat in the oven prior to adding the salted caramel and ice cream. You get the exact same result this way, so it’s perfect if you’re having company! 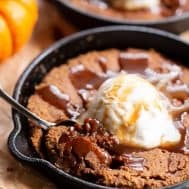 In fact (and you can verify this with my family) skillet cookies are by far my #1 dessert to serve to guests. 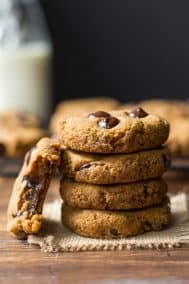 They’re more fun than regular cookies, secretly easier than regular cookies, and do so well with toppings. They also happen to make great birthday “cakes”/desserts, in my opinion, but now I’m getting off topic. As for the skillet you bake this in, I have only tested it out with cast iron. However, any oven proof skillet should work just fine. The batter will fit best in either a single 9-10″ skillet, or two 6” skillets – as I used. I like to coat the bottom of my skillets with a thin layer of coconut oil, which seems to prevent any annoying sticking after baking. 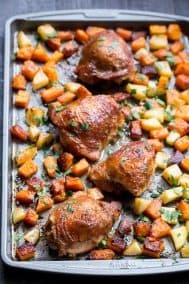 If you don’t have oven proof skillets, you can also use a comparably sized cake pan or square baking pan. If you aren’t sure about the “stickiness” of your pan, you can always line it with parchment paper. I do this almost always when I bake cookies, brownies, breads, etc. Are you ready to dive into pumpkin dessert heaven?! Yes!! Let’s bake! Combine the coconut milk and coconut sugar in a small saucepan over medium heat and whisk, bringing to a boil. 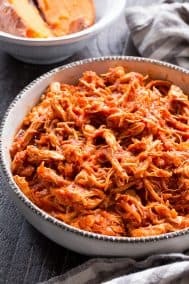 Once boiling, continue to whisk and cook over med heat for about 5-10 minutes (it should be bubbling but not overflowing) until the mixture is reduced, thickened and a deep caramel color. 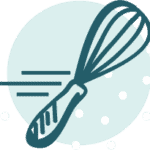 Make sure you continue to whisk while cooking to avoid burning. Preheat your oven to 350 degrees and grease a 9-10" oven proof skillet or 2 5-6" skillets with coconut oil. Transfer the mixture to your 9-10" oven proof skillet greased with coconut oil OR divide between two smaller skillets (I used 2 6" skillets). Bake in the 350 degree oven for 15-18 minutes or until set in the center. Remove from oven and drizzle with 2-3 Tbsp of salted caramel right right away. 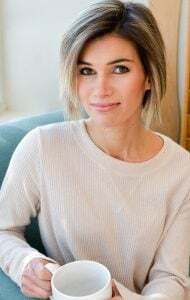 Allow to cool part way and serve warm, topped with coconut vanilla ice cream*** and more salted caramel sauce** if desired. Enjoy! *Store leftovers covered in the refrigerator for up to 3 days. **Store leftover salted caramel sauce in a covered container in the refrigerator for up to 1 week. Best thing to eat right out of the skillet? This looks fabulous, but I have a question? In the salted caramel part, when do you add the sugar? This looks soooo delicious! I think I will try it on our family camping trip soon. Only thing is, one of my boys is allergic to eggs. :/ Do you think this will still come together okay if I use egg replacer? Or maybe applesauce? I think you could try 2 “flax eggs” and it should be fine. Mix 2 Tbsp flaxseed meal with 5 tbsp water and allow to sit 15 mins before adding. 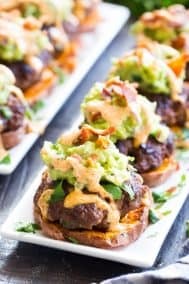 This looks soo indulgent and more than the 192 calorie listed. Thank you, thank you, thank you!! Hi-I made this last night for a football party. So good-everyone liked it, even the kids. Served with a cashew ice cream that was delicious. The caramel sauce is my new favorite! I’m in trouble now….ha! 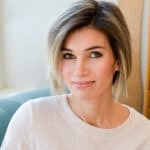 Love your recipes. Thank you! Wow, i love this food. But i have to read about it tomorrow because today I’m hungry then it’s not good idea if I read about food uh? This looks delicious and I can’t waut to make it tomorrow. One question though. You’re description describes it as fudgy but I don’t see any chocolate listed in the ingredients.